Sonu Ke Titu Ki Sweety earned ₹ 0.02 Cr between day 57-63, Now Total Collection ₹ 108.95 Cr ! Sonu Ke Titu Ki Sweety earned ₹ 0.10 Cr between day 50-56, Now Total Collection ₹ 108.93 Cr ! Sonu Ke Titu Ki Sweety earned ₹ 0.12 Cr between day 46-49, Now Total Collection ₹ 108.83 Cr ! Sonu Ke Titu Ki Sweety earned ₹ 0.25 Cr between day 43-45, Now Total Collection ₹ 108.71 Cr ! Sonu Ke Titu Ki Sweety earned ₹ 0.14 Cr on its 42nd Day, Now Total Collection ₹ 108.46 Cr! Sonu Ke Titu Ki Sweety earned ₹ 0.17 Cr on its 41st Day, Now Total Collection ₹ 108.32 Cr! Sonu Ke Titu Ki Sweety earned ₹ 0.16 Cr on its 40th Day, Now Total Collection ₹ 108.15 Cr! Sonu Ke Titu Ki Sweety earned ₹ 0.18 Cr on its 39th Day, Now Total Collection ₹ 107.99 Cr! Sonu Ke Titu Ki Sweety earned ₹ 0.42 Cr on its 38th Day, Now Total Collection ₹ 107.81 Cr! Sonu Ke Titu Ki Sweety earned ₹ 0.34 Cr on its 37th Day, Now Total Collection ₹ 107.39 Cr! Sonu Ke Titu Ki Sweety earned ₹ 0.28 Cr on its 36th Day, Now Total Collection ₹ 107.05 Cr! Sonu Ke Titu Ki Sweety earned ₹ 0.54 Cr on its 35th Day, Now Total Collection ₹ 106.77 Cr! Sonu Ke Titu Ki Sweety earned ₹ 0.46 Cr on its 34th Day, Now Total Collection ₹ 106.23 Cr! Sonu Ke Titu Ki Sweety earned ₹ 0.42 Cr on its 33rd Day, Now Total Collection ₹ 105.77 Cr! Sonu Ke Titu Ki Sweety earned ₹ 0.47 Cr on its 32nd Day, Now Total Collection ₹ 105.35 Cr! Sonu Ke Titu Ki Sweety earned ₹ 1.05 Cr on its 31st Day, Now Total Collection ₹ 104.88 Cr! Sonu Ke Titu Ki Sweety earned ₹ 0.83 Cr on its 30th Day, Now Total Collection ₹ 103.83 Cr! Sonu Ke Titu Ki Sweety earned ₹ 0.48 Cr on its 29th Day, Now Total Collection ₹ 103 Cr! Sonu Ke Titu Ki Sweety earned ₹ 0.83 Cr on its 28th Day, Now Total Collection ₹ 102.52 Cr! Updated: Sonu Ke Titu Ki Sweety earned ₹ 2.55 Cr on its 13th Day, Now Total Collection ₹ 101.69 Cr ! Updated: Sonu Ke Titu Ki Sweety earned ₹ 1.47 Cr on its 21st Day, Now Total Collection ₹ 101.73 Cr ! Updated: Sonu Ke Titu Ki Sweety earned ₹ 0.81 Cr on its 27th Day, Now Total Collection ₹ 101.53 Cr ! Sonu Ke Titu Ki Sweety earned ₹ 0.87 Cr on its 27th Day, Now Total Collection ₹ 101.59 Cr! Sonu Ke Titu Ki Sweety earned ₹ 0.78 Cr on its 26th Day, Now Total Collection ₹ 100.72 Cr! Sonu Ke Titu Ki Sweety earned ₹ 0.76 Cr on its 25th Day, Now Total Collection ₹ 99.94 Cr! Sonu Ke Titu Ki Sweety earned ₹ 2.32 Cr on its 24th Day, Now Total Collection ₹ 99.18 Cr! Sonu Ke Titu Ki Sweety earned ₹ 2.11 Cr on its 23rd Day, Now Total Collection ₹ 96.86 Cr! Sonu Ke Titu Ki Sweety earned ₹ 1.27 Cr on its 22nd Day, Now Total Collection ₹ 94.75 Cr! Sonu Ke Titu Ki Sweety earned ₹ 1.27 Cr on its 21st Day, Now Total Collection ₹ 93.48 Cr! Sonu Ke Titu Ki Sweety earned ₹ 1.76 Cr on its 20th Day, Now Total Collection ₹ 92.21 Cr! Sonu Ke Titu Ki Sweety earned ₹ 1.83 Cr on its 19th Day, Now Total Collection ₹ 90.45 Cr! Sonu Ke Titu Ki Sweety earned ₹ 1.82 Cr on its 18th Day, Now Total Collection ₹ 88.62 Cr! Sonu Ke Titu Ki Sweety earned ₹ 4.66 Cr on its 17th Day, Now Total Collection ₹ 86.8 Cr! Sonu Ke Titu Ki Sweety earned ₹ 4.12 Cr on its 16th Day, Now Total Collection ₹ 82.14 Cr! Sonu Ke Titu Ki Sweety earned ₹ 2.27 Cr on its 15th Day, Now Total Collection ₹ 78.02 Cr! Sonu Ke Titu Ki Sweety earned ₹ 2.49 Cr on its 14th Day, Now Total Collection ₹ 75.75 Cr! Sonu Ke Titu Ki Sweety earned ₹ 2.59 Cr on its 13th Day, Now Total Collection ₹ 73.26 Cr! Sonu Ke Titu Ki Sweety earned ₹ 2.62 Cr on its 12th Day, Now Total Collection ₹ 70.67 Cr! Sonu Ke Titu Ki Sweety earned ₹ 2.71 Cr on its 11th Day, Now Total Collection ₹ 68.05 Cr! Sonu Ke Titu Ki Sweety earned ₹ 7.02 Cr on its 10th Day, Now Total Collection ₹ 65.34 Cr! Sonu Ke Titu Ki Sweety earned ₹ 6.55 Cr on its 9th Day, Now Total Collection ₹ 58.32 Cr! Sonu Ke Titu Ki Sweety earned ₹ 5.83 Cr on its 8th Day, Now Total Collection ₹ 51.77 Cr! Sonu Ke Titu Ki Sweety earned ₹ 4.86 Cr on its 7th Day, Now Total Collection ₹ 45.94 Cr! Sonu Ke Titu Ki Sweety earned ₹ 4.41 Cr on its 6th Day, Now Total Collection ₹ 41.08 Cr! Sonu Ke Titu Ki Sweety earned ₹ 4.93 Cr on its 5th Day, Now Total Collection ₹ 36.67 Cr! Sonu Ke Titu Ki Sweety earned ₹ 5.17 Cr on its 4th Day, Now Total Collection ₹ 31.74 Cr! Sonu Ke Titu Ki Sweety earned ₹ 10.81 Cr on its 3rd Day, Now Total Collection ₹ 26.57 Cr! Sonu Ke Titu Ki Sweety earned ₹ 9.34 Cr on its 2nd Day, Now Total Collection ₹ 15.76 Cr! Sonu Ke Titu Ki Sweety earned ₹ 6.42 Cr on its 1st Day, Now Total Collection ₹ 6.42 Cr! The film "Sonu Ke Titu Ki Sweety" would be hitting the theatre screen on February 9, 2017. 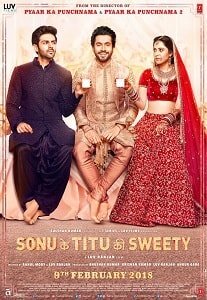 The first look of the film 'Sonu Ke Titu Ke Sweety' came out today with all the three leading actors.